Provincetown, MA: The Alden Gallery will present “Kevin Cyr and Robert Morgan,” a two-person show, on Friday, August 22, 2014, from 7 to 9 p.m., at the gallery’s exhibit space at 423 Commercial St. Drinks and refreshments will be served at the reception; the gallery is open to the public and free. The exhibit will be on view through September 4. There is nothing that Kevin Cyr likes more than traveling around the streets and byways of cities (such as New York or Boston, Shanghai or Brussels), photographing trucks and old cars and vans and campers. To Cyr, the more neglected and damaged and sprayed with graffiti they are the better. 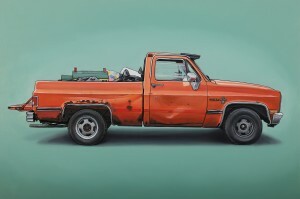 He then returns to his studio and transforms these vehicles into the subjects of regal, hyper-real portraits, every blemish faithfully reproduced, set against an invented solid-color backdrop. “Painting these objects gives me a chance to document a time and place, and to make still a part of the ever-changing environment,” Cyr says. Recent shows in Manhattan and San Francisco have pushed Cyr’s vehicle portraits to new prominence. The Alden Gallery is proud to have him back for a seventh season. San Francisco artist Robert Morgan fell in love with Provincetown many years ago, when he took workshops with Robert Henry, Jim Peters, Gregory Amenoff, and others at the Fine Arts Work Center. “Most of my oils and watercolors deal with men in relationship to the outdoors and each other, often at beaches,” says Morgan, who can often be found photographing subjects around town in August. “The seductive combination of sun, sea, sand, and men’s bodies is one I long to preserve in paint.” Morgan has had decades of experience doing just that, and the Alden Gallery welcomes him back for a seventh show in our Provincetown exhibit space.